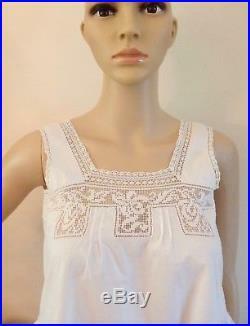 VINTAGE EYE LOVE IS PLEASED TO OFFER.. A CIRCA 1900s/TEENS ANTIQUE VINTAGE. EDWARDIAN / AESTHETIC MOVEMENT ERA. A SUPER-RARE FIND IN THIS EXCELLENT ANTIQUE CONDITION. 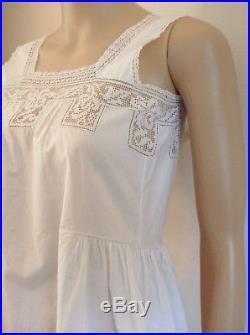 SUITABLE FOR SIZE 0/XS WOMAN OR A YOUNG PERSON. 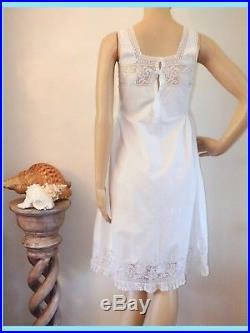 This Antique Edwardian-Era Cotton Nightgown Slip Dress with Lace Filet and Bobbin Lace is a Treasure. - rarely seen in such fine condition! Similar Lacework and Refined Workmanship could be seen as intricate yet subtle embellishment on ladies white-on-white day dresses and children's clothing worn for a holiday by the sea. Airy and light like bright billowing clouds on a perfect blue sky! The lace also served as welcome ventilation on hot summer days -- kind of amazing that something so painstakingly intricate and beautiful could also be utilitarian. Also amazing that these many different lace techniques used a century ago matched the weight. Balanced Construction and Well-Proportioned Design create a Simply Harmonious and Sublime Effect. With 3 Real, Carved, Saucer-Shaped, White MOP Mother of Pearl Buttons on the back. This Gorgeous Antique Full Slip Dress/Nightie is a Total Dream! The Perfect Addition to your Vintage Boudoir/Lingerie Collection! MEASUREMENTS Mannequin is approximately 5 Feet 9 Inches Tall. 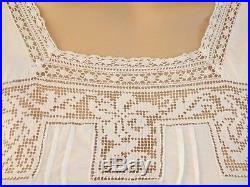 OVERALL LENGTH MEASURED SHOULDER TO HEM: APPROXIMATELY 39 1/2 INCHES LONG. HIGH ARMPIT TO ARMPIT MEASUREMENT, JUST BENEATH STRAP. TOP OF STRAP TO EMPIRE WAIST SEAM: APPROX. Excellent Antique Edwardian Vintage Condition. 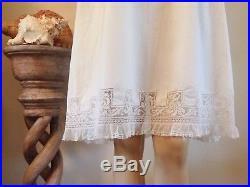 This Rare Antique Edwardian White Cotton Slip Nightgown with Filet Lace/Bobbin Lace/Net Lace is Superb! There is no major wear whatsoever. Cotton fabric is fresh and clean; there are no stains, no tears, no holes, no foxing, no weak spots in fabric. 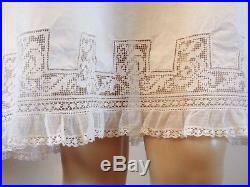 Filet Lace/Bobbin Lace/Net Lace is Excellent/ Near Pristine, very clean and very firm throughout; there are just 2 very minor tiny holes in the net lace flounce hem in the front -- see last photo. All 3 Antique MOP Real Shell Buttons on Back are Excellent, and all Loop Closures are in Excellent Working Order. Carefully-Stored in a smoke-free home. Please See All Photos, as they are part of the description. A Wonderful & Rare Wearable Piece for your Antique Lingerie Collection. Please Note: Sometimes there may be a reflection from the digital camera, which creates a dark or light area in the photos. These "dark/light spots" are not on the item; any markings will be noted and described above in the Condition under Item Description. Thank you for visiting Vintage Eye Love shop! 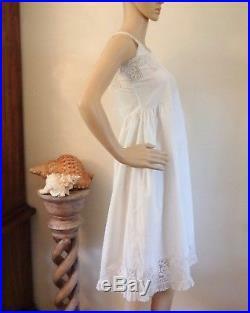 The item "EUC Antique EDWARDIAN Vtg Filet LACE/Bobbin Lace Cotton Slip Nightgown DressXS" is in sale since Friday, August 17, 2018. 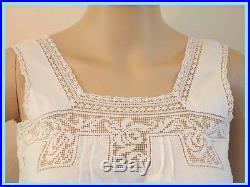 This item is in the category "Clothing, Shoes & Accessories\Vintage\Women's Vintage Clothing\Sleepwear & Robes". The seller is "vintage_eye_love" and is located in Toms River, New Jersey. This item can be shipped to United States, Canada, United Kingdom, Denmark, Romania, Slovakia, Bulgaria, Czech republic, Finland, Hungary, Latvia, Lithuania, Malta, Estonia, Australia, Greece, Portugal, Cyprus, Slovenia, Japan, China, Sweden, South Korea, Indonesia, Taiwan, South africa, Thailand, Belgium, France, Hong Kong, Ireland, Netherlands, Poland, Spain, Italy, Germany, Austria, Israel, Mexico, New Zealand, Philippines, Singapore, Switzerland, Norway, Saudi arabia, Ukraine, United arab emirates, Qatar, Kuwait, Bahrain, Croatia, Malaysia, Brazil, Chile, Colombia, Costa rica, Dominican republic, Panama, Trinidad and tobago, Guatemala, El salvador, Honduras, Jamaica, Antigua and barbuda, Aruba, Belize, Dominica, Grenada, Saint kitts and nevis, Saint lucia, Montserrat, Turks and caicos islands, Barbados, Bangladesh, Bermuda, Brunei darussalam, Bolivia, Ecuador, Egypt, French guiana, Guernsey, Gibraltar, Guadeloupe, Iceland, Jersey, Jordan, Cambodia, Cayman islands, Liechtenstein, Sri lanka, Luxembourg, Monaco, Macao, Martinique, Maldives, Nicaragua, Oman, Peru, Pakistan, Paraguay, Reunion.